In 1937, Franklin D. Roosevelt signed the US Marijuana Tax Act that made it illegal to sell or use this herb. Nevertheless, cannabis continued to be used by a small number of citizens in the United States, including jazz musicians, entertainers, and cognoscenti desiring an altered state of mind. During the 1960s, cannabis use became a symbol for the youth revolution. It was widely used as a mild euphoric on college campuses and among counterculture youth. I remember well coming to parties in Cambridge, Massachusetts, during that heady era and being offered the choice of an alcoholic beverage or a hand-rolled marijuana cigarette. Since then, social use of this herb has continued at a more moderate pace. In recent years, a synthetic form of its active ingredient, delta-9-tetrahydrocannabinol (THC) (6aR-trans-6a-tetrahydro-6,6,9-trimethyl-3-pentyl-6H dibenzol(b,djpyran-a-01) has been approved by the Food and Drug Administration and is being prescribed to combat chemotherapy and acquired immunodeficiency syndrome–induced anorexia and nausea. This approved agent is named “dronabinol,” with several trade names, including Marinol (AbbVie Inc, North Chicago, Ill). On occasion, I have prescribed it to stimulate appetite and improve mood in apathetic, anorexic, and frail elderly patients, in whom it seemed to have a positive effect. 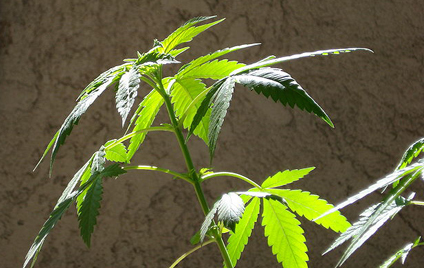 As a result of the 1937 law, as well as further criminalizing legislation passed during the Nixon administration, marijuana has become a major source of income for illegal drug smugglers. A major site of illegal drug importation is the United States–Mexico border. Hardly a week goes by here in Arizona without news reports involving seizures of large quantities of cannabis by US Border Patrol and Drug Enforcement Administration (DEA) agents, who work constantly to impede the flow of this agent into the United States. The DEA has spent more than $100 billion trying to stop the flow of illegal drugs, including marijuana, into the United States. Unfortunately, the country continues to be flooded with illegal pharmaceuticals and marijuana courtesy of powerful drug cartels. A 2010 ABC news poll found that 81 percent of Americans favored medical marijuana use and its decriminalization for this purpose. Many other individuals lobby for repeal of the 1937 law forbidding marijuana sale and use. These citizens argue that marijuana should be regulated, sold, and taxed in a manner similar to tobacco and alcohol products. 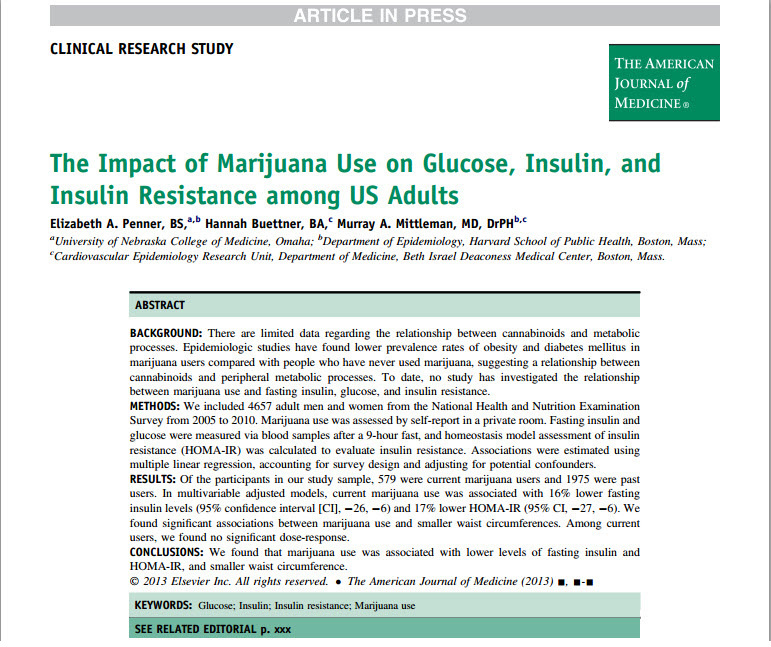 This epidemiologic, observational study demonstrated that among diabetic patients who admitted to using marijuana, insulin resistance was decreased and diabetic control was improved. Penner et al5 analyzed data obtained during the National Health and Nutrition Survey between 2005 and 2010. They studied data from 4,657 patients, of whom 579 were current users of cannabis, 1,975 used cannabis in the past but were not current users, and 2,103 had never inhaled or ingested marijuana. These patients had fasting insulin and glucose levels measured along with a test for insulin resistance. Remarkably, fasting insulin levels were reduced in current cannabis users but not in former or never users. Two additional observations were that waist circumference was smaller and high-density lipoprotein cholesterol blood levels were higher in current cannabis users. These are indeed remarkable observations that are supported, as the authors note, by basic science experiments that came to similar conclusions. 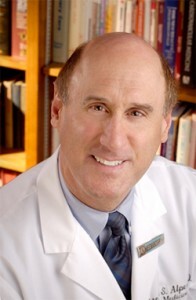 MSNBC featured an interview with lead investigator Murray Mittleman, MD, PhD.